One day, long ago, there was a certain man who noticed a flock of a dozen wild turkeys who gathered in the same clearing in the woods at about the same time nearly every day. Since times were tough and his family often went hungry, the man decided he would capture those turkeys and his family could eat well for quite a while. So, the man went out into the woods with a large wooden crate, a length of string and the last of the corn and grain his family had for making bread. He turned the crate upside down and used a stick to prop one end of it up off the ground. He next placed a pile of cracked corn and grain under the crate. Finally, he tied a long string to the stick and held onto the other end as he hid in some nearby bushes. When the turkeys went under the crate to eat the corn and grain, the man would pull the string which would dislodge the stick. The crate would then fall trapping the turkeys inside the upside down crate. 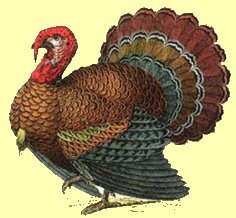 After about two hours, the twelve turkeys wandered from the woods and toward the trap the man had set for them. One-by-one, the turkeys gathered under the crate--all except one particularly large turkey who, for some reason, stood just outside the create refusing to walk in. Eleven of the twelve birds were already standing under the crate, but the man decided to wait until this last bird wandered in before pulling the string. That way, he would have all twelve turkeys. After a few minutes, one of the eleven turkeys already under the crate walked back out and over to where the twelfth bird was standing. "I can't pull the string now," the man thought, "I had eleven in the trap and now I have only ten. I'll wait until that eleventh bird wanders back into the trap." While the man was waiting for that to happen, another turkey wandered out of the trap. "Well now I have to wait," thought the man, "for now I have only nine birds in the trap which before held ten. I'll wait for one of those others to walk back into the trap before pulling the string." This pattern continued with one turkey after another wandering out of the trap and the man continuing to wait for his situation to improve. Before long, there was only one turkey still standing in the trap. "I certainly can't pull the string now," decided the man, "I will not settle for only one bird when I could have had eleven; and besides, I have already spent so much of my corn and grain. I've gone this far, I'll just hold on until things get better" Finally, all of the remaining corn and grain had been consumed by that last bird and it too wandered out of the trap. All twelve turkeys now strolled back into the woods and were soon completely out of sight. The man gathered up his crate and his string, and walked back home without even a single turkey. As if that weren't bad enough, he now had to return home without even the corn and grain he had when he started. I tell this story to say this: Don't let greed lead you into making a bad decision based upon previous bad decisions. In other words, sometimes you have to just cut your losses and take what you have. Trying too hard to get "more" in order to attempt to make up for previous mistakes and bad choices often ends up costing you dearly. At the time of this writing, there is a very popular television game show called "Deal Or No Deal." In this game show, contestants try to raise the amount they can win higher and higher. They have the option of taking the offered amount at any time or continuing to play in an attempt to move the amount even higher. As the game progresses, the amount they can win goes up and down depending upon how the game is going. My family and I love the show and watch it every week.. What I have noticed in watching the show is that nearly every contestant falls for the turkey trap effect. They often start out with a good plan and a point at which they will take whatever the offer is and walk out with the money; but, as the game progresses greed leads them right into a turkey trap situation. As they see the amount offered going higher and higher, they start to get greedy and soon forget about their original plan. Instead of thinking about what they could do with the large amount of money currently being offered, they start thinking about what they could do if the amount were just a little bit higher, so they play on. Before long, they make a bad judgment call in the game and the amount offered drops. Now, instead of looking at the money that is still available to them, they only think about how high it was before. They don't want to settle for less when they had so much more a minute ago; so, they play on convinced that their situation will improve. This thinking continues until the contestant either gets smart and takes what money they still have, or they reach the end of the game with almost nothing remaining. Do you see the turkey trap? I actually watched one woman fall for the turkey trap winning one penny after having the offer as high as nearly a quarter million dollars. Although the turkey trap can apply to such things as education, relationships, careers and even health; it applies mainly to financial matters. Putting more and more money into a business that has been losing money for years hoping that, some day, it will turn around. Unless something has dramatically changed, the greater possibility is that the business will not turn around. If a business is taking you down financially, it might be time to get rid of it and cut your losses. Wanting to sell a stock or other investment but refusing to do so because that stock or investment used to be worth so much more than it is now. It has dropped so far from where you bought it, that you just can't bring yourself to take the loss. In a case like this, you often end up watching the value continue to fall while you refuse to sell because it used to be worth more. Sometimes, you just need to sell the stock or investment, take the loss, and put the money you have left into something more promising. Continually spending money you can't really afford on a boat or car that you really should get rid of. The boat or car has depreciated to so much less than you originally paid for it, that you just can't bring yourself to take the loss. You would probably be far better off to get rid of it and put the money you have been spending on it into savings. Buying more and more expensive accessories to try to keep an outdated or cheaply built product going. Sooner or later, even all of the accessories and upgrades won't be enough to keep whatever it is functional, and you'll end up getting rid of it anyway. It might be time to just get rid of it and put all of the money that was going for accessories and upgrades toward a new, higher quality, updated product. Spending money on an education for a profession you have come to discover you would hate to do for the rest of your life. You refuse to give it up and change directions because you have already sunk so much money into the education and because you know how much money you could make in that particular career even though you hate it. Maybe you should just change directions, start re-educating for a career you would love to do, and just take the loss on the money spent thus far. These were just a few examples of financial turkey trap situations. There are many, many more. If you ever suspect that you may be falling for a turkey trap, just remember that it is often an indication of greed or pride. Make every effort to avoid turkey traps in your life--especially financial ones. They seldom work out and you usually end up gong home with nothing but your wooden crate and a length of string. This article copyright © 2008 by Keith C. Rawlinson (Eclecticsite.com). All rights reserved.